← Too cloudy to see the total lunar eclipse? Try a webcast! This was by far the most challenging imaging project I have attempted to date. It represents a four-panel mosaic of an area called the “Gulf of Mexico” which is part of a much larger area of nebulosity called The North American Nebula or NGC7000. This object is located in the constellation of Cygnus. This four-panel mosaic was acquired over a period of three weeks. Total exposure time was 56 hours. We’ve had a long stretch of clear skies here in Ohio which made this image possible. 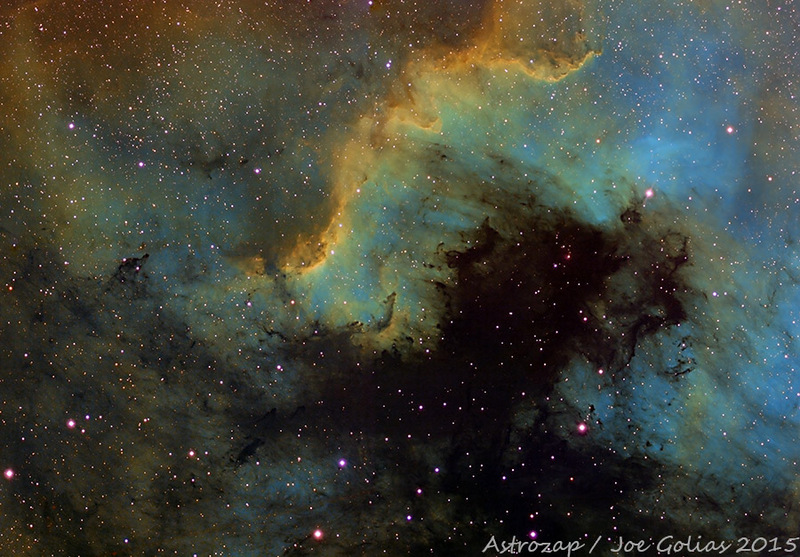 This entry was posted in Uncategorized and tagged astronomy, astrophoto, cygnus, deep space, golias, Gulf of Mexico, Joe Golias, member photographs, nebula, NGC7000, North America Nebula, photograph. Bookmark the permalink.